Club Penguin Cheats by Mimo777 Club Penguin Cheats by Mimo777: Club Penguin Puffle Experience Improvement! Remember when Club Penguin told us about an improved puffle experience in a video Billybob made. Well, tomorrow is the day it will be updated! What improvements has the team made to the puffle experience? The biggest thing is that we've added stat bars back. Other than that we've added notifications and puffle emotes. If your puffle needs something, a little notification will pop up in-world to let you know you need to take care of your puffle. And if you go to your igloo and your puffle really needs your attention, a little icon bubble will appear over his/her head to let you know what to do. What's your favorite thing that's coming out this week? Stat bars! They really help you understand how different items affect your puffles and what you need to do to keep them happy. They work way better than the original stat bars. A few people have asked me why penguins are bigger in igloos now. Why are they bigger in igloos? When we updated the igloo puffle art we noticed that the igloo puffles had really grown in relation to penguins. In fact, they were almost the same size as their penguin owners! It didn't look right, so we decided to make the penguins a little bigger to match the new puffle size. We also think that an igloo is a penguin's home, so it should feel a little cozier than being outside in the world. Having bigger penguins seemed to help this. Dood, did you notice the sticky notes at the bottom of the screen? 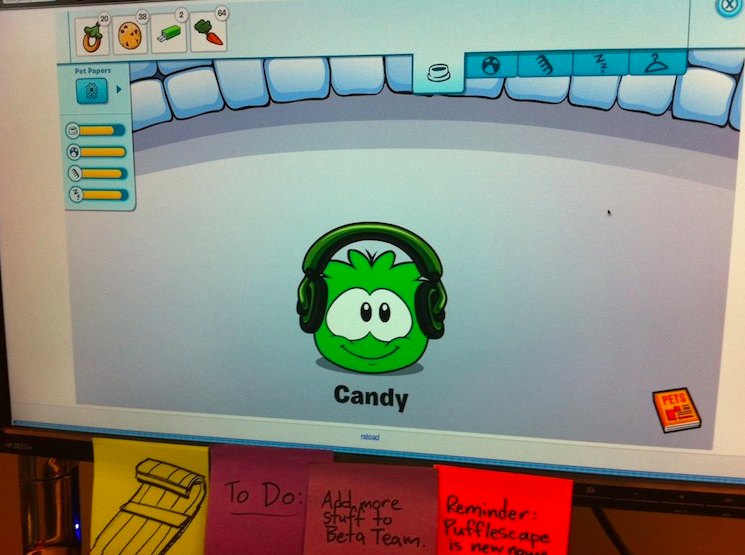 Club Penguin is going to add more stuff to the Beta Team and, Pufflescape is new??? Soooo cool! Are you excited about these puffle stat bars and changes? Do you have a favorite puffle hat? has anybody noticed on the bottom of the picture it has a to do list and it says to add more stuff to beta team and the reminder sticky is says pufflescape is new ... I don't know what the last word says, but could it possibly be game? Epic!! I can't wait, now I know when my puffles are full!! Was that photo tookin from the creators of cp? At the bottom of the picture, there is 3 stickers and one says Add more stuff to Beta Team! :O I think the last sticker says PuffleScape to be new game in REAL Clubpenguin! Did anybody noticed their computer was huge?! Hey Mimo, one glitch I noticed, I went to visit my friend's igloo (who's a member) and if you notice, the puffles stand still and they don't move at all! And then I went to visit some other friends iggs (members and non members) their puffles didn't move! But when I went to my igloo, the puffles moved around! I still prefer the old size of my penguin in the igloo. Oh welllll. gnarlygurl, the last word is now. i studied it really close. mrs.awesomeness, yes it was taken from the creators of cp. kimosabe550, your computer is not huge, your penguin got huge. yes daphine, its a new touch! Sophia, The update was because your penguin was the same size as the puffle so they needed to make penguins bigger(Like usual), Its for a good reason, but I know what you mean by it looks worst. Dear Fire4564, Its not exactly a glitch and it happens because they are not your puffles and they don't move when you click on them either and when you go into your "iggy" the puffles move because they are yours if you were on the peoples accounts that didn't move they would move. When I go to my friends iggy it they don't move either.